Three reports from the National Endowment for the Arts reveal new findings about the impact of arts and cultural industries on GDP, as well as how and why Americans participate in certain arts activities. 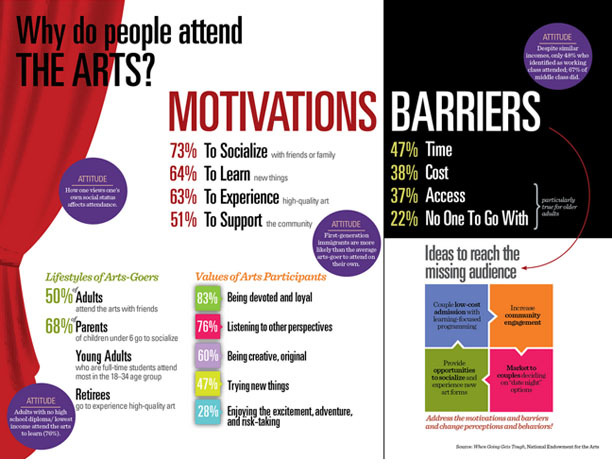 The data for the three reports is all from 2012, so for the first time the NEA can show a comprehensive view of a single year in the life of the arts and cultural sector from three different angles: supply, demand, and motivations for consumer behavior. The new information will help arts providers and others more effectively understand and develop strategies to engage individuals and communities in the arts.